One company has had some recent struggles, while the other has had big problems since making a major purchase. Picking Frontier Communications (NASDAQ:FTR) over Verizon Communications (NYSE:VZ) would require believing that both companies would have a major change in direction ahead. Frontier has been sputtering since its $10.54 billion purchase of what were once Verizon's wireline customers in California, Texas, and Florida (CTF). Since closing that deal on April 1, Frontier has disappointed. The company has lost subscribers in all three quarters since it purchased the CTF properties, and while it has achieved significant cost savings from roughly doubling in size, there are legitimate concerns it may not be able to reverse its subscriber loss. Verizon, for its part, has not been perfect. The company has been adding customers, but total revenue declined 4.3% in 2016. Still, while Frontier lost $373 million in 2016, almost double its $196 million loss in 2015, Verizon remains decidedly profitable. The company saw its earnings per share dip from $4.38 in 2015 to $3.22 in 2016, a number it expects to be "fairly consistent with 2016," according to its Q4 earnings release. Both of these companies are struggling with at least some of the same problems. Consumers have more choices, and that creates pricing as well as service pressure. 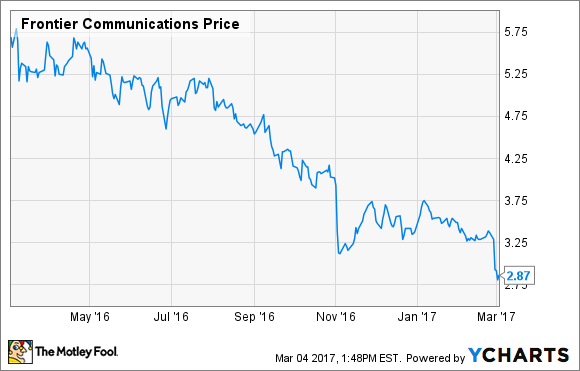 Verizon isn't flying as high as it once was, but Frontier has yet to show that it can actually make money. Under what scenario is Frontier a better buy? When you're thinking about buying a stock, it's sometimes worth considering where you'll be buying in. Frontier, for example, has been heading steadily in the wrong direction. That slide has been well earned, because so far, through three quarters of owning the CTF properties, very little has gone right. In Q4, Frontier saw its total residential customer base drop from 5.03 million at the end of Q3 to 4.89 million to close the year. That's a drop of 144,000 subscribers, not appreciably different from the 155,000 lost in Q3. In addition, Frontier's business-customer base dropped by 16,000, and it lost 96,000 broadband customers as well as 84,000 video subscribers. That compares with a loss of 12,000 business customers, 99,000 broadband homes, and 92,000 video subscribers in the previous quarter. Average revenue per residential user, which climbed in Q2 after the Verizon deal was completed, has dropped in Q3 and Q4. In addition, overall revenue has fallen steadily, which makes sense, given fewer subscribers and falling revenue per remaining subscriber equation. Where the company has succeeded is in delivering cost-saving efficiencies from the acquisition. It has steadily increased its annualized cost synergy target since taking over the CTF properties. Currently, that number stands at "$1.6 billion, with $1.25 billion to be realized by end of Q1 2017, and $1.6 billion by end of Q2 2018," according to the Q4 earnings release. It's in that operating efficiency where you can make a case for Frontier. Its CEO, Dan McCarthy, has shown a strong ability to manage the company well, and if he can deliver the subscriber turnaround he has promised (and failed to deliver on) for the past two quarters, then the upside here could be high. Verizon stock has much less risk. Image source: Verizon. Is Verizon or Frontier a better buy? Verizon may struggle in a changing climate that pushes its margin and profit down. It's unlikely, however, that the company will see a major collapse in its revenue, and it's possible that after a transition it will return to revenue growth. Frontier, on the other hand, is a boom-or-bust proposition. The company may not have hit bottom, but it can certainly see it, and it's either going to make a roaring comeback or sell its currently dwindling-value assets at a less-than-premium price. The company has recently revised its revolving credit line to buy it more time to create its turnaround. It won't take much more than the next year to see if McCarthy can deliver subscriber growth (which would allow it to stay on its own) or at least stabilize things (which would at least allow for a sale at a premium price). Going forward, however, while Verizon has a much pricier stock, it's also the better value. The company has much less downside risk and a better chance of getting things moving in the right direction. Verizon's not going to go bankrupt or be sold under distress. There's a stronger chance that happens with Frontier than with the company actually managed to reverse its negative trends.